click to see them bigger! 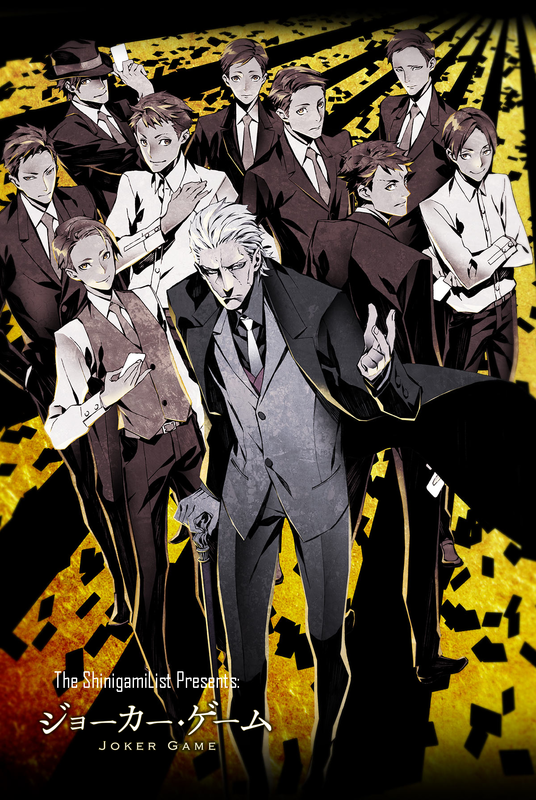 New information and initial art have been revealed for the upcoming Joker Game anime adaptation of the original novels by Kouji Yanagi. It was but just three days ago when I wrote about the future adaptation and we just knew the director, character designer and production company. Well, now you’ll know more. Including this lovely image to the left, there are many new details to grin at. Introduction, character designs, character profiles and more is already available on the official website of the anime. It was inactive when I announced the anime adaptation. The year is 1937; World War Two is in its peak. The autumn lets every passion smouldering. “Agency D” is a secret department of specially trained individuals. These individuals are chosen from the civilians – people who graduated from common educational institutions such as Kyoto University or the Tokyo University departments. But they are not ordinary humans, they are only those who can pass an extensive and very severe testing for superhuman abilities. Lieutenant-Colonel Yuki “The Lord of Darkness” – the director of Agency D.
Izawa – one of the stories in the original novels depicts this agent’s endeavours in Britain, his capturing and escaping the UK intelligence departments. More characters will be revealed; and, when it happens, I will be here to tell you all about them! Which ones of you are seinen lovers? I am getting more and more excited about this anime! Geralt of Rivia, I assume this is you?! Maaan, it does look like him! Wow. I am impressed and very hyped ;) Thanks.